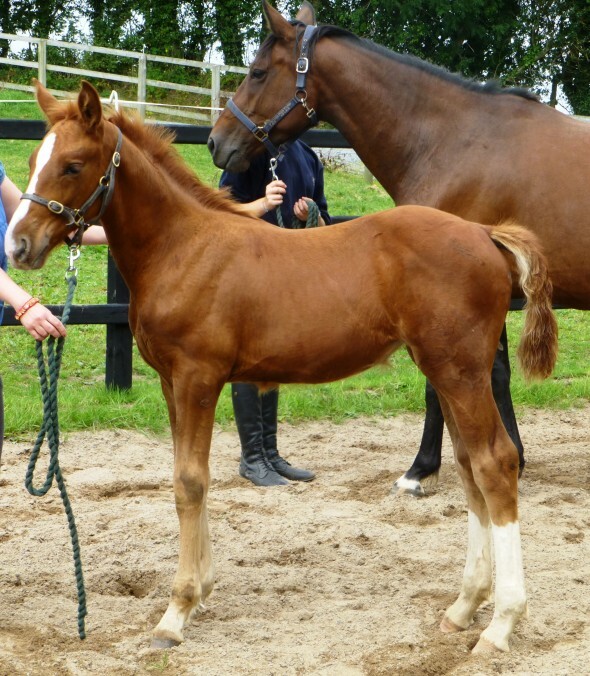 Ringfort Coromandel, bay 2016 colt foal bred in the purple. 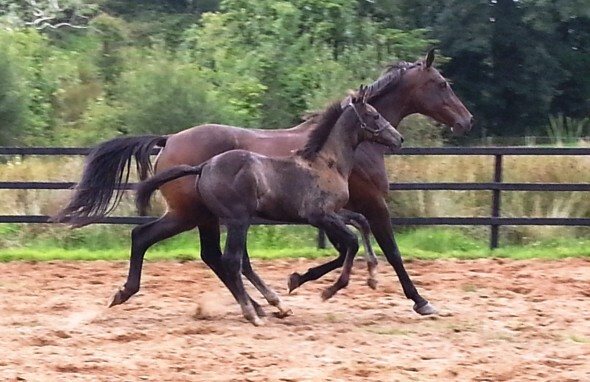 By Connor (Casall la Silla ex Korrada by Cor de la Bryere, a full sister to Corrado1) out of our Belgian warmblood well-related broodmare and former showjumper, Vienda van't Kelderken. 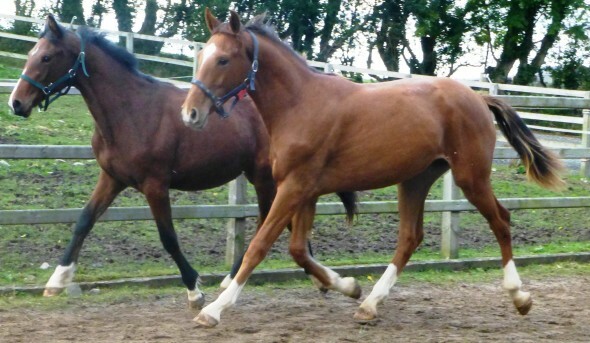 Video of our 2015 foal/rising yearling, Ringfort Reve du Moulin (by Glasgow van't Merelsnest out of Moulin Fontaine, our top broodmare whose dam has THREE World Cup show-jumping siblings. Additional information about Moulin Fontaine and the sire Glasgow van't Merelsnest can be found on the drop down menu under her name. 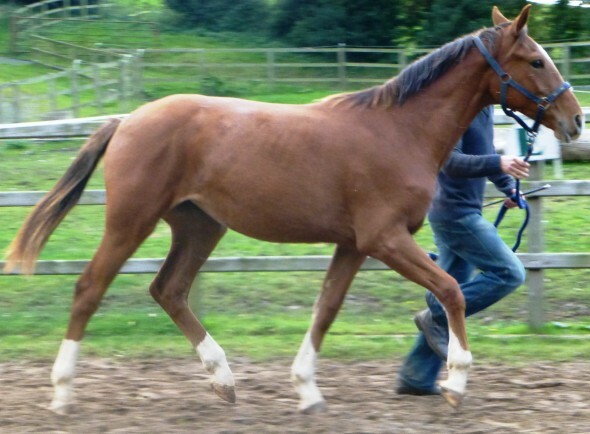 SOLD TO BELGIUM: Ringfort Jack Sparrow - (top performance 2014 colt foal). SOLD! 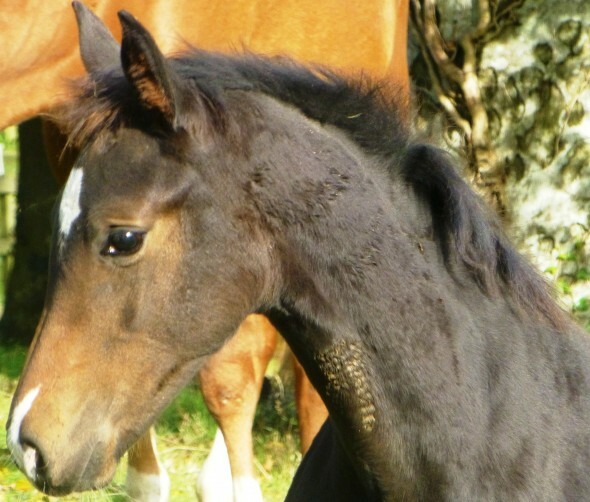 Ringfort Jack Sparrrow, Dun colt foal, rising yearling, by Cheeky Bobby Sparrow out of Ringfort Glass Slipper who is out of Garryhinch Cinderella by Westside Mirah. Everything below here has been sold. Extremely elegant and athletic filly, suitable for breeding or performing, by the exciting young stallion Camilo VDL by VDL Douglas who won the Five Year Old Show-jumping Championship at Dublin Horse Show in 2012, and in a class of more than 260 of the best six year old horses in Europe, won the second qualifier at Lanaken on 20th September 2013. 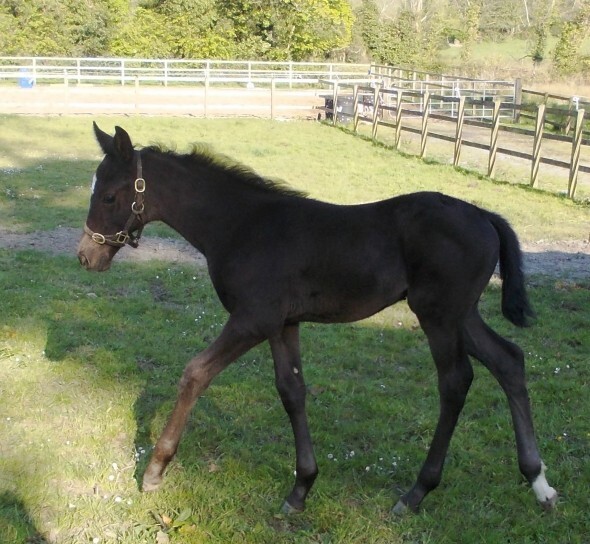 The filly is the first foal out of Moulin Fontaine (by Alligator Fontaine) out of Hortense du Moulin. 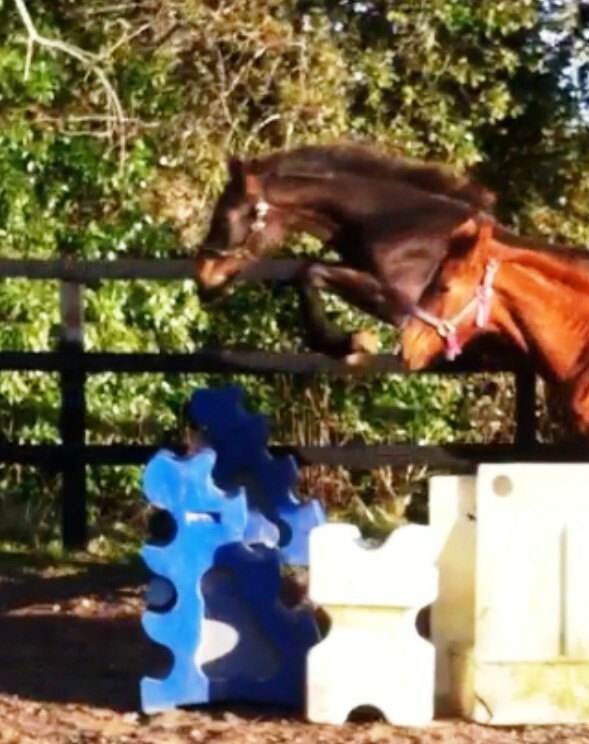 1st dam, Moulin Fontaine, is a half sister to 1.35m show jumper Tell Me (Darragh Kenny USA). 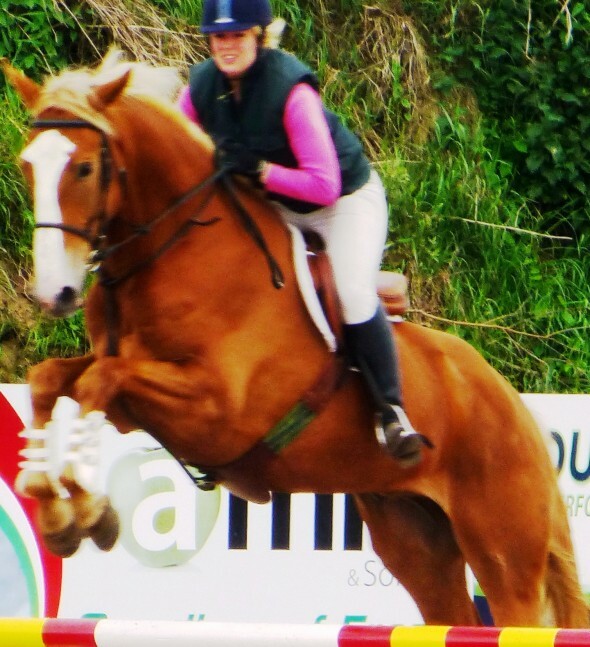 She is also sister to the 1.20m show jumper Jingle Du Moulin (Darragh Kenny), who placed 2nd in the 5yo Final at Cavan, and is now jumping in France. 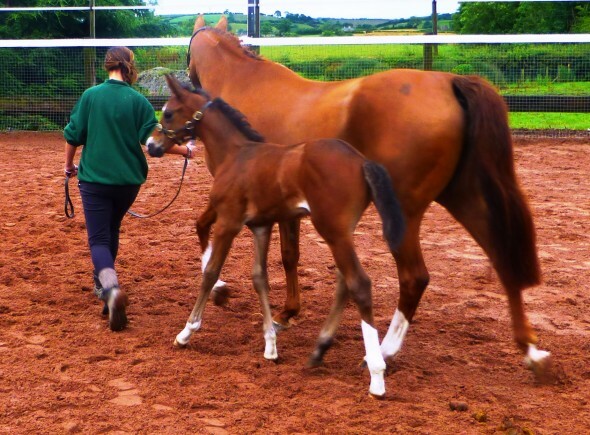 The second dam, Hortense du Moulin, is a half-sister to three top international horses. 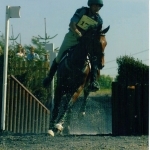 Klotaire du Moulin, a 1998 Fully Approved Stallion by Voltaire competed at 1.60 by Penelope Le Provost; Ella du Moulin a 1992 mare by Voltaire which competed at World Cup level with Eric Navet and Patrice Delaveau; and Bleu Perche, a 1989 stallion by Palestro which represented Chile at the World Equestrian Games in Jerez in 2002. 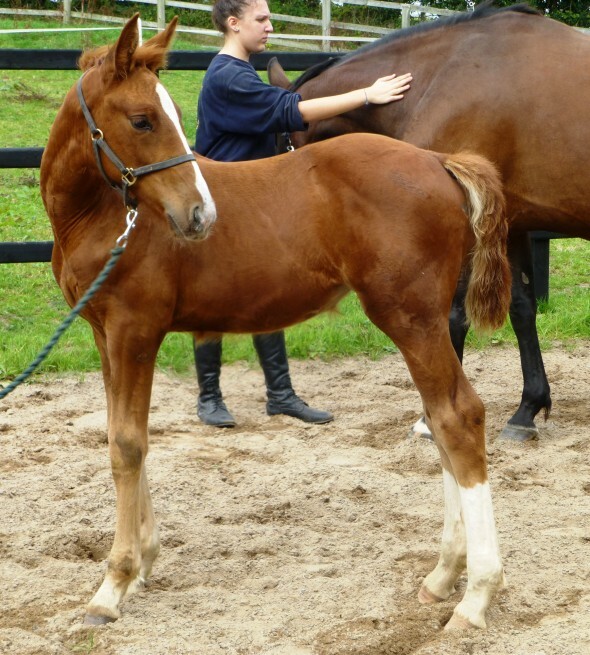 This filly’s damsire, Alligator Fontaine, seems to be proving a good broodmare sire. In recent weeks he has been the damsire of the winner of the famous Le Baule in France – a mare called Ornella Mail sired by Lando and from an Alligator Fontaine mare ridden by Patrice Delaveau.
. The most famous offspring of Alligator Fontaine is a mare called Jalisca Solier who was also ridden by Steve Guerdat to many successes at International level. 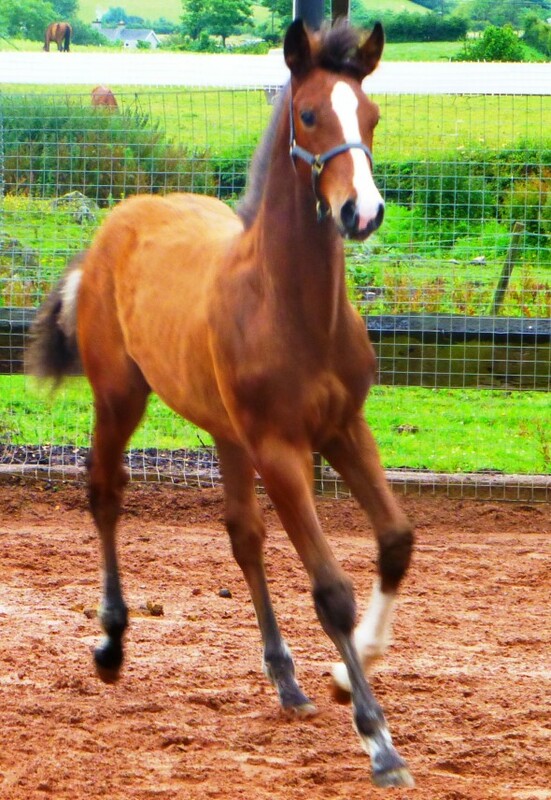 Quality, elegant colt foal with the breeding, outlook and class to become a show-jumping stallion. 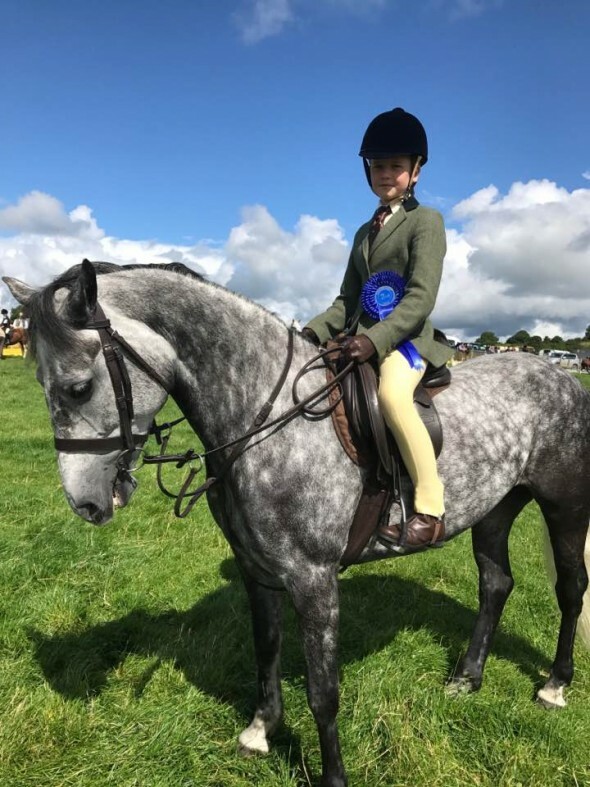 He is out of the successful performance mare, Ushi, by the only fully Approved Nations Cup son of Cruising standing in Ireland – former Irish Army horse Ringfort Cruise. Dam: Ushi by Flemmingh. 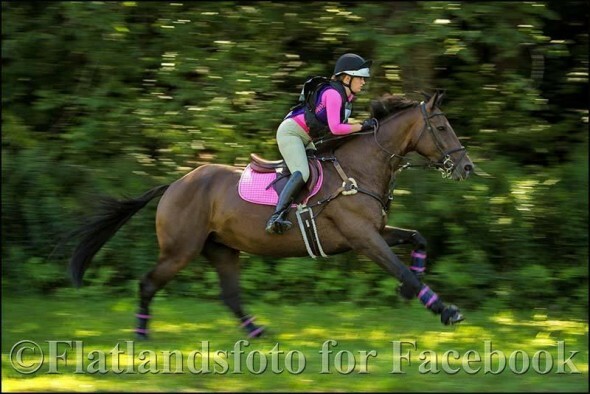 Winning eventing mare with half-sister Rosita x Great Pleasure (Grannus) ex Nimmerdor mare jumping 1.30 in Sweden. 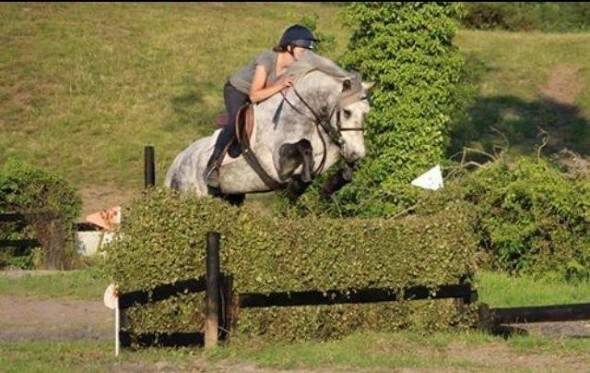 Raddisson ex Rosita jumping 1.20 in Sweden. 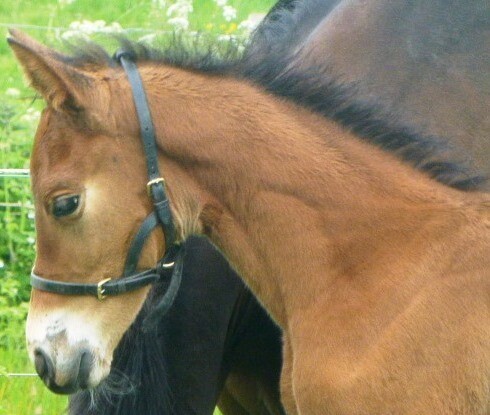 Ushi, is descended from the famous Barona-stamm mare line. 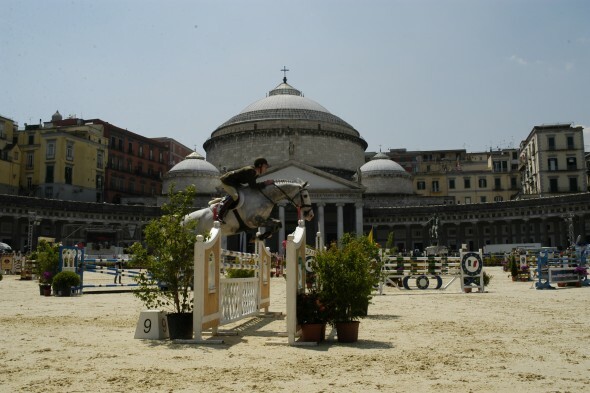 Famous horses that descend from this mare line include the KWPN Approved stallion Durango VDL, International show jumper Urone (Olivier Philippaerts) and Jommiro Z (Alexander Wagner). 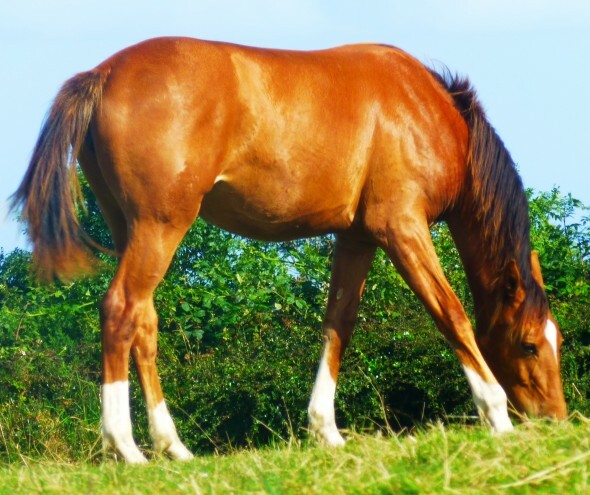 The mare line is one of the best available in Holstein. Besides Flemmingh, his dam produced three other approved sons: Gaspari I and II and the Holstein Champion Litorio. Flemmingh sires beautiful, big, long-lined horses with three perfect gaits. This is proven by the great number of his Ster and Keur mares and champion foals. 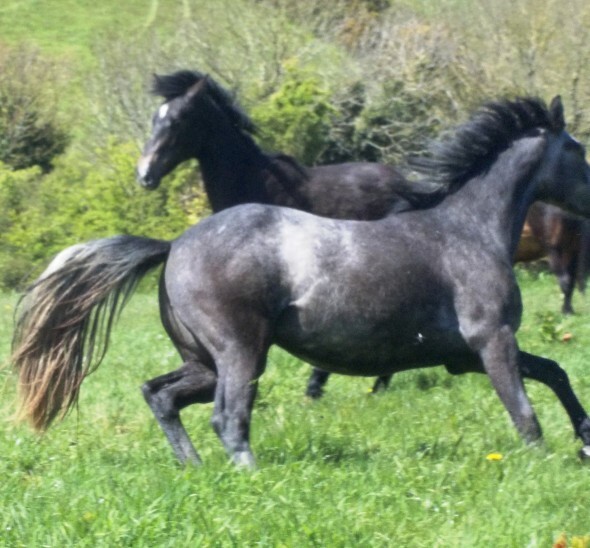 Ringfort Cruise is by the legendary stallion Cruising, who in turn was sired by the Irish Draught Stallion Seacrest. 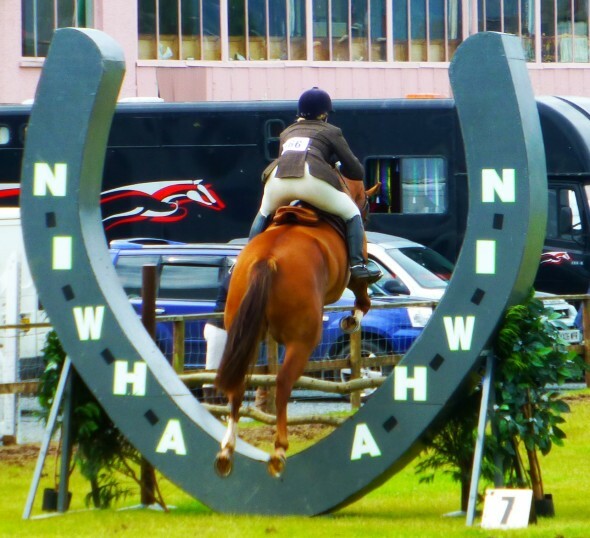 Cruising, now a household name, was sire to many International showjumpers such as: Flexible, Sails Away, World Cruise, Mo Chroi, Cruise Hill, Cruisings Mickey Finn, Cruiseway, Killossery Kruisette, and Master Cruise. 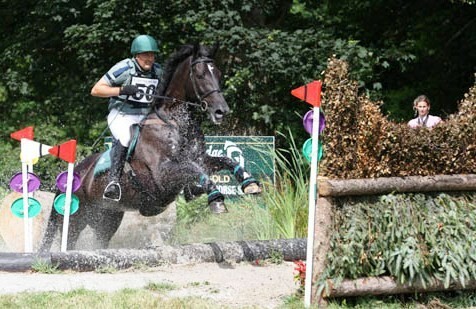 (and the No.1 ranked eventer, Mr. Medicott). Cruising became famous for his tremendous success in the ring. 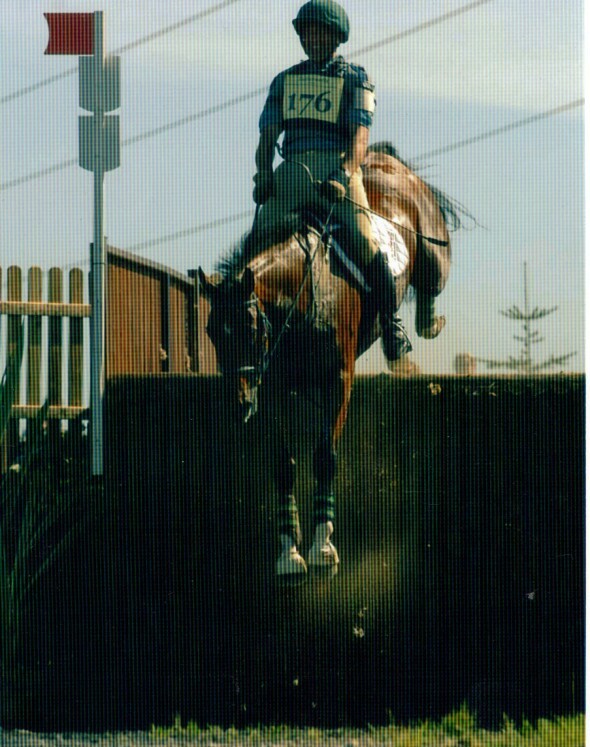 His wins include: 1st at Aachen 1999, 1st Dortmund 1999, 2nd World Games, Grand Prix Rome 1997. He won numerous World Cup Qualifiers including: World Cup Millstreet 1997 & 1998 and Geneva 1999, and participated on 5 Nations’ Cup teams for Ireland as did Ringfort Cruise. 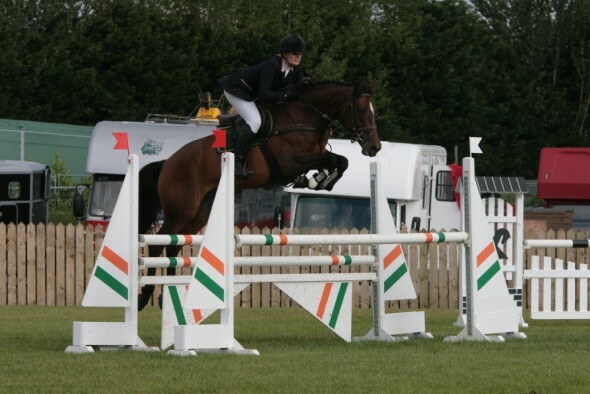 Ringfort Cruise’s dam is Renkum Woudina, dam of the three Approved stallions including Renkum Englishman who was also a Grade A showjumper. 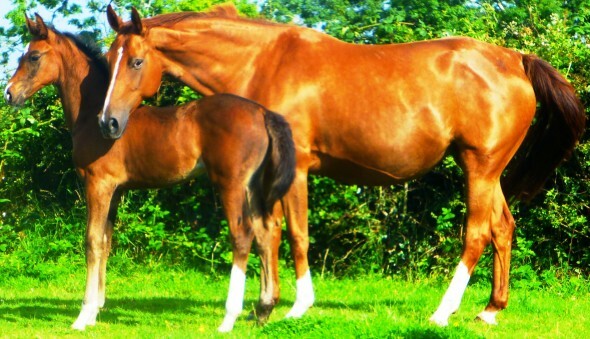 Woudina is by the famous showjumping stallion Nimmerdor, who is also sire of the stunningly successful stallion Heartbreaker – giving the best of Irish and European lines in this young colt. 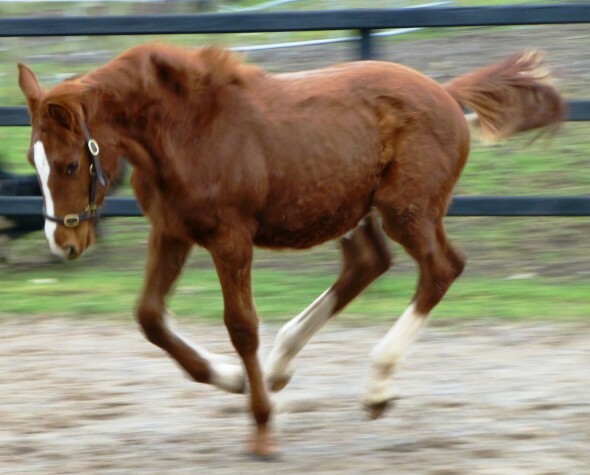 This filly shows great quality with an elegant neck and flowing movement. She shows great athleticism over a small cross-pole, tucking her legs up neatly in front, and using herself strongly behind. 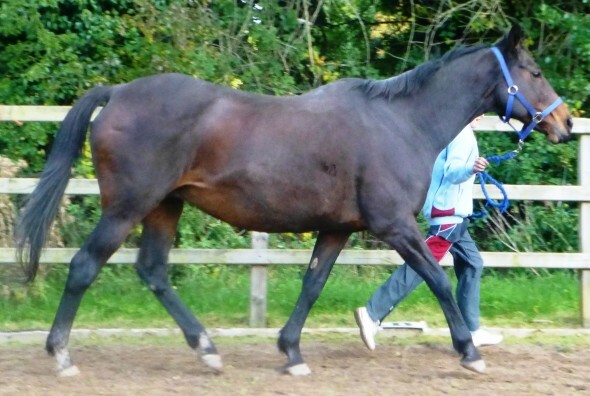 FOR SALE: RINGFORT REDWOOD - RISING SIX YEAR OLD GELDING BY IROKO (BY PILOT) OUT OF RENKUM INGLEWOOD (BY RENKUM ENGLISHMAN). 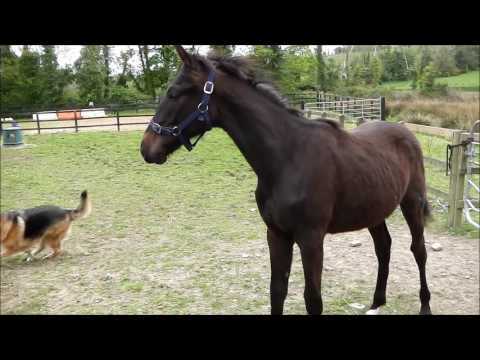 This is poor quality video of Blondie, aka Ringfort Redwood by Iroko out of Renkum Inglewood out of Wood be Good by St.Leger winner Athen's Wood (TB). 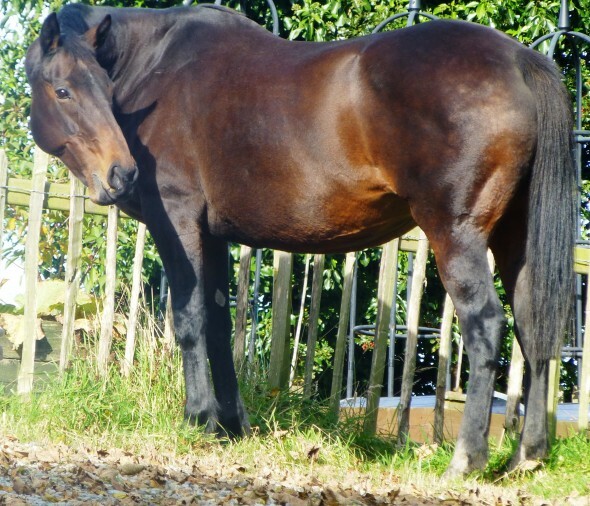 Renkum Inglewood was by the stunning stallion Renkum Englishman out of the Nimmerdor mare, Renkum Woudina, dam of Ringfort Cruise and two other Approved stallions. 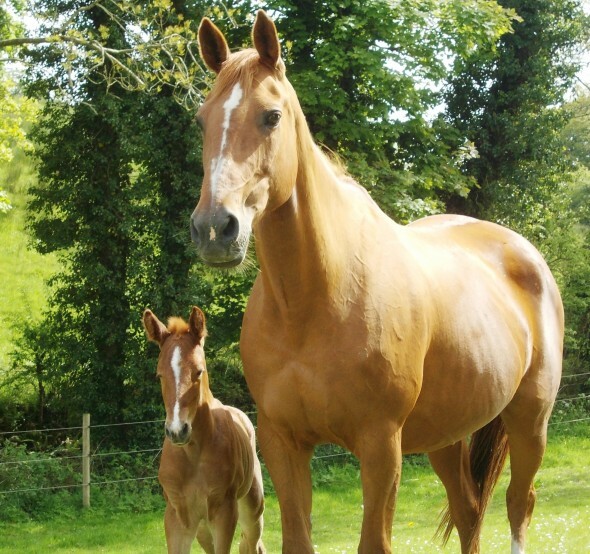 Blondie is around 17 hands so, while he was broken as a four year old, he has just been growing on in the field at Ringfort Stud since he was a foal. He is now five years old and ready to go on. 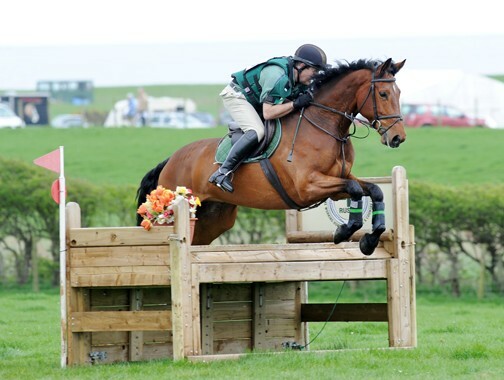 He is a touch green but is showing a spectacular jump over poles and across country... nice flowing paces and an excellent temperament. 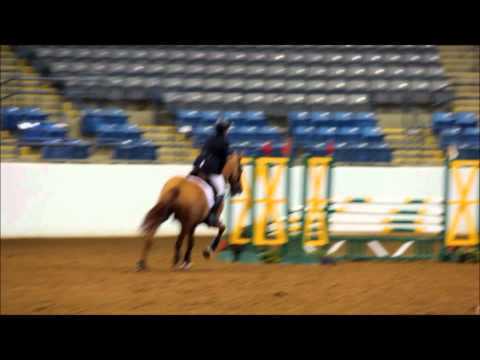 Show-jumper or eventer - there is nothing this horse won't do. (See below) RINGFORT REDWOOD'S HALF-BROTHERS - ALL OUT OF RENKUM INGLEWOOD. 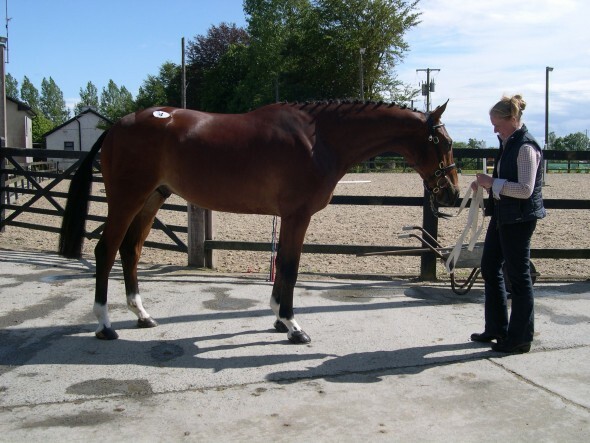 New owner in North Carolina, Mikaela Kantorowski is very happy with Ringfort Swan Song...."She is fantastic! Everybody who we have come into contact with loves her and my trainer, Robert Costello, is convinced he is going to steal her from me. I have run some trainings on her and she has placed at almost every one including winning the spring season championship after having only run two events. (that was at the novice level) I look forward to progressing with her and hoping to move her up to preliminary next season. She is such a lady around the barn and my mother and my sister have been able to ride her as well. She is a joy to own and ride. She was even featured in the local newspaper for one of the spring events". 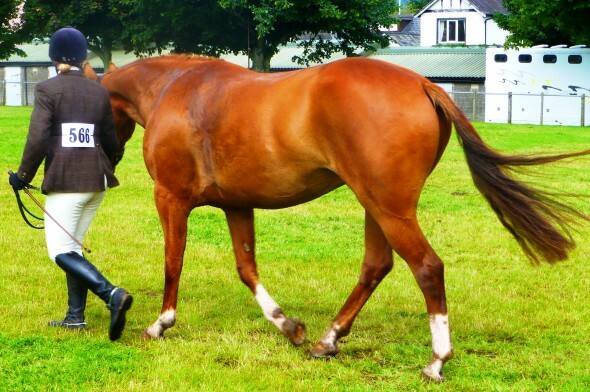 IROKO is one of the most influential Sires to stand in Ireland today. 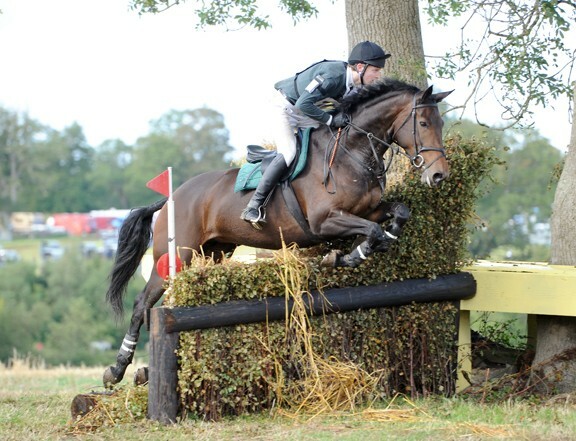 His Keur Award has proved itself over and over as he is a leading sire of Stallion sons, brood mares, World Cup progeny in both Dressage & Show-jumping, and now also eventing. His sire Pilot is famously known as jumping progenitor of the nineties, claiming a top ranking in the German index with 193 points. Pilot also produced Everest Showtime, Panama and Pinocchio, the latter whose grand dam is a full sisiter to Iroko's grand dam. 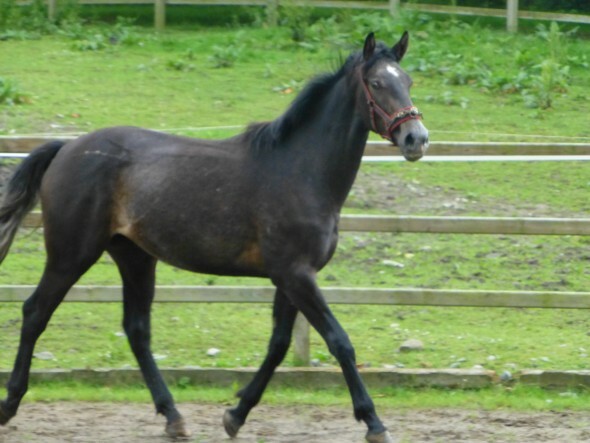 Iroko is bred out of the State Premium Awarded Mare, Bianca, a daughter of the famous Sire Bengale. 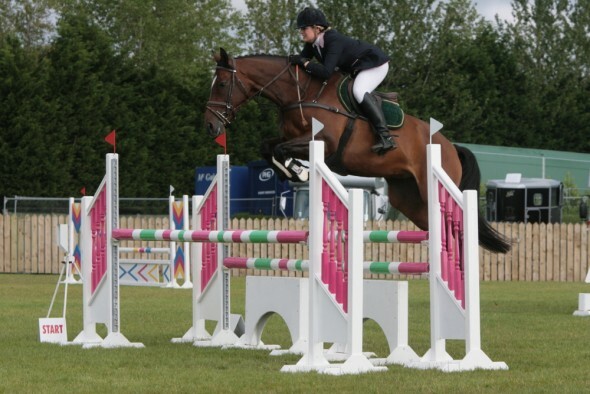 Bengale's offspring won over half a million pounds in the show-jumping sport. Bianca relates back to the Stallion Remus, who is also sire of Renoir and Romandour II, both top dressage Sires. Iroko proved himself over and over in the show-jumping sport with winnings too numerous to mention, which included a 2nd in the Grand Prix in Zuidlaren, 1st in Grand Prix of Leeuwarden, and 4th in Verona. 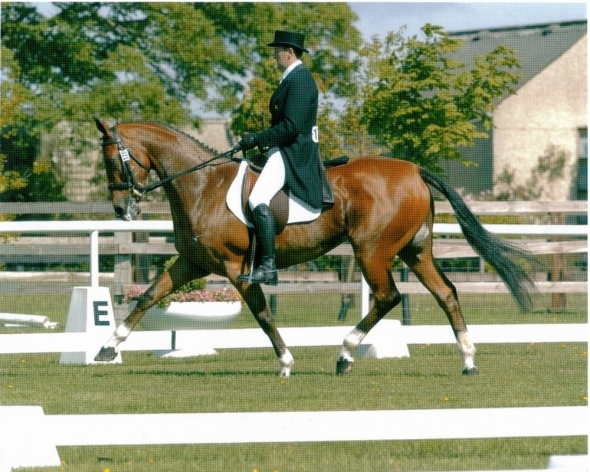 Iroko was leading the KWPN Index with 177 points in 2000 and 2001, and was leading sire of show-jumpers in North America. Iroko's offspring are famous all over the world, The Fly with Todd Minikus win the overall championship for 6 year old horses before going on to become a World Cup winner. 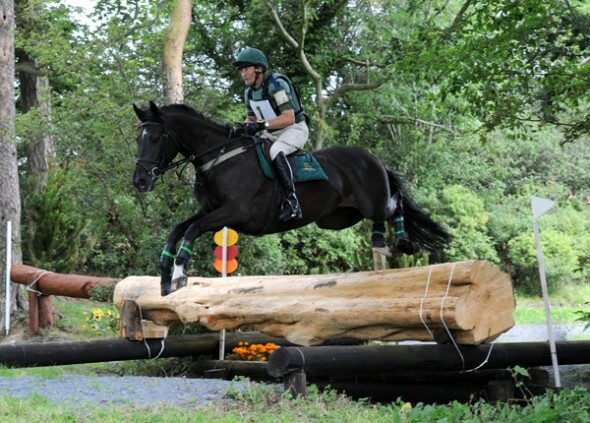 Closer to home, Irish rider Darragh Kerins, won the Grand Prix of New York with Nabucca (by Iroko) in 2004. 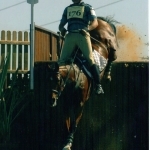 Reo, and Michael Cave, won the 6/7 year old Championships in Belfast 2004. Samurai with Albert Zoer is competing successfully on the World Cup tour and Golden Coin with Max Kuehner is a competing regularly at 1.60m level competition. 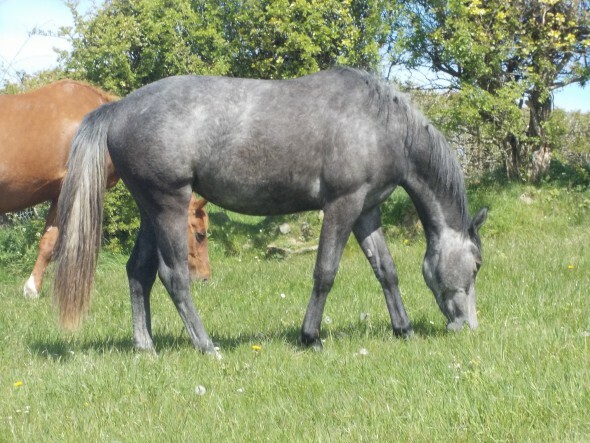 A dark grey three year old Class 1 Connemara mare by Westside Mirah out of Garryhinch Cinderella. EVERYTHING BELOW HERE IS ARCHIVAL - AND STOCK IS SOLD! 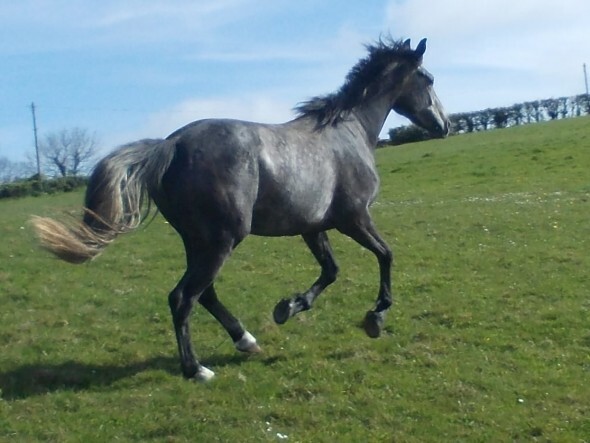 A DARK GREY THREE YEAR OLD GELDING BY RINGFORT CRUISE OUT OF THE THOROUGHBRED MARE, STONEBECK. STONEBECK IS A FULL SISTER TO HEINEKIN CUP WINNER MAHLER, A MULTIPLE WINNER OVER HURDLES HERSELF, AND HAS BRED WINNERS ON THE TRACK. 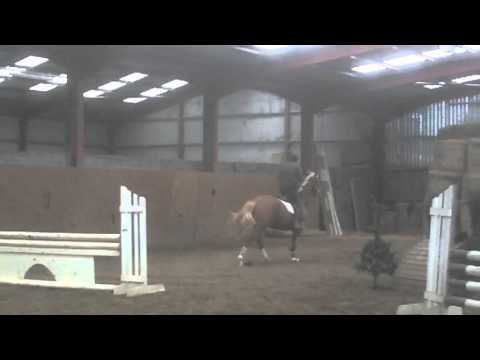 Following a lot of ground-work in June and July this young horse is now broken and riding, and trotting over poles. He is demonstrating a beautiful temperament and is hacking quietly on the road. 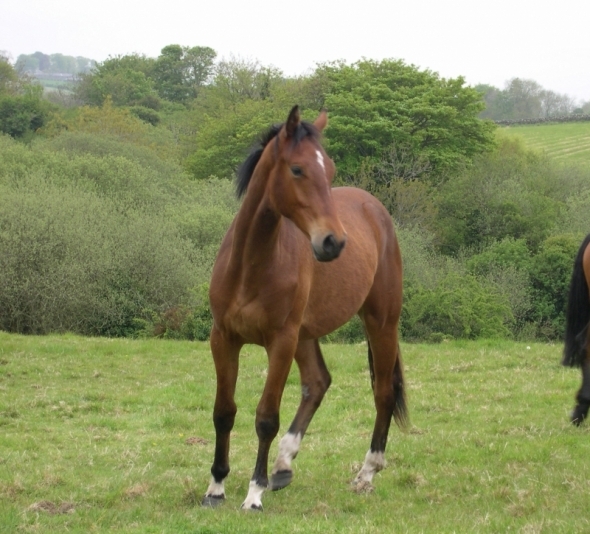 EXCELLENT ELEVATED PACES, PERFECT TEMPERAMENT. 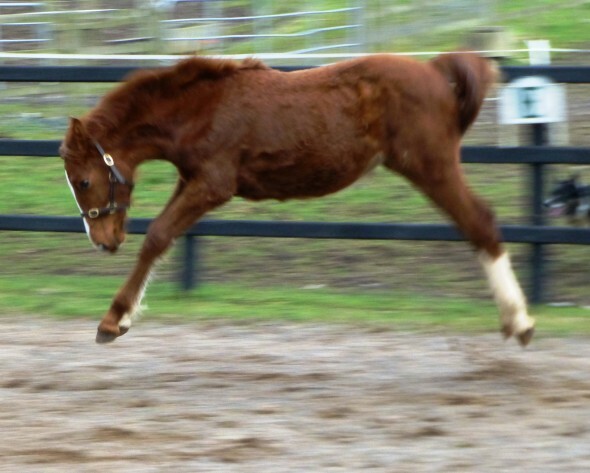 WILL MAKE TOP DRESSAGE OR WORKING HUNTER/SHOW HORSE. BLEMISH ABOVE HIS EYEBROW WHICH WILL NOT AFFECT HIS PERFORMANCE IN ANY WAY BUT IS PRICED ACCORDINGLY. 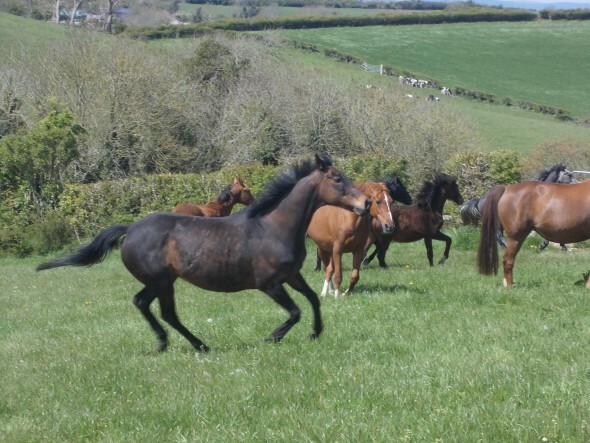 If you are interested in purchasing any of the Ringfort broodmares and young stock, they can be seen by appointment from 5th to 7th October at the stud. Telephone Diane on her mobile 0044 7793491005 to arrange a time to visit. 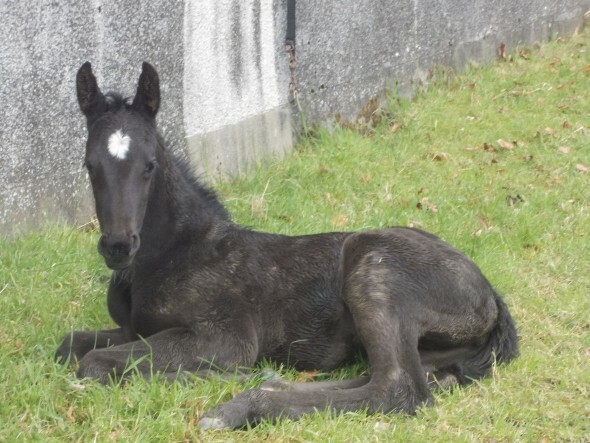 NOTE: SEE MORE PICTURES OF THREE OF THE FOALS FOR SALE (RINGFORT PATRON SAINT, RINGFORT SOLO CROSSING, AND RINGFORT FINALE) UNDER "NEWS" AND VIDEO AS BELOW. 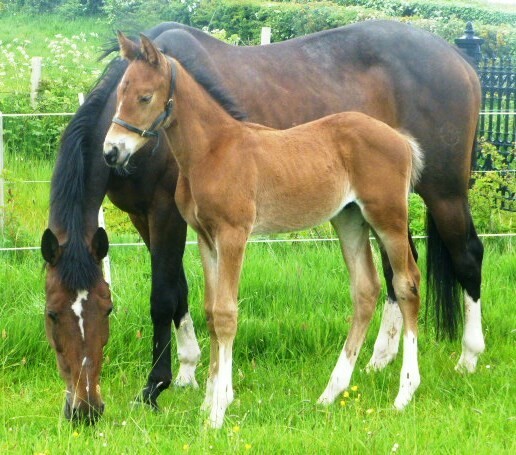 VIDEOS: TO SEE A VIDEO OF MARES AND FOALS GO TO YOUTUBE, ENTER 20120820(171233) AND HIT SEARCH. 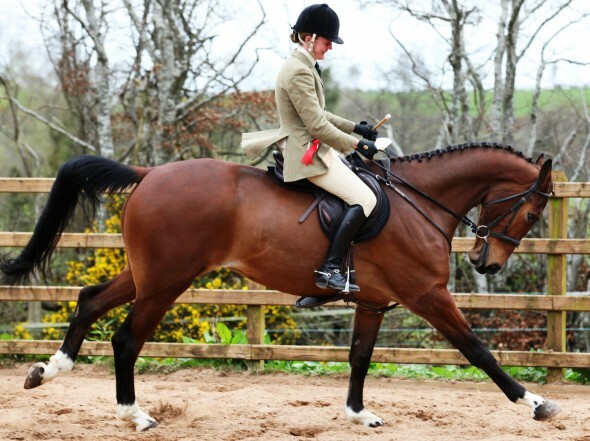 Stunning, elegant sporthorse broodmare registered with Irish Horse Register and Brandenburg Studbook. 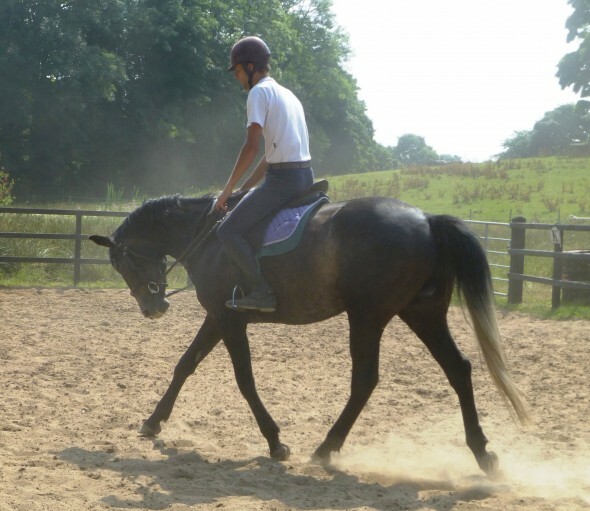 The mare has perfect conformation, is 10 years old and has the most outstanding paces. Her temperament is also lovely, both in and out of the stable. 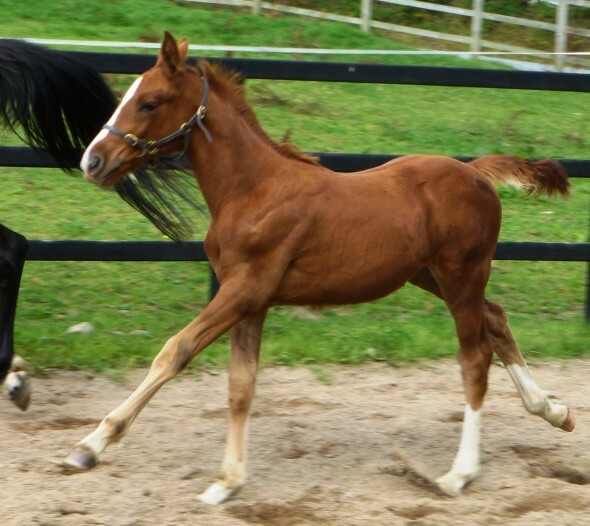 PISTAZIE is by Paradiesvogel (Bird of Paradise) out of Premiere, out of Primadonna, one of the most highly decorated mares in the studbook. Poetin, a Brandenburger mare related to Pistazie, was a successful dressage horse and sold for a record amount at auction - €2.5 million! 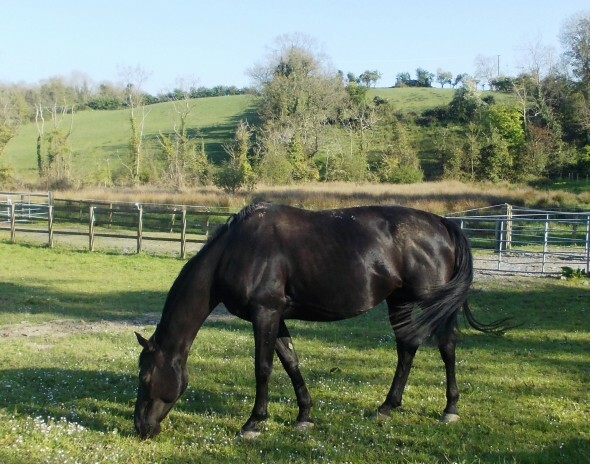 Samichel (below) on 8th October 2012, enjoying the Autumn sunshine at Ringfort Stud, the day before leaving for the Sales. 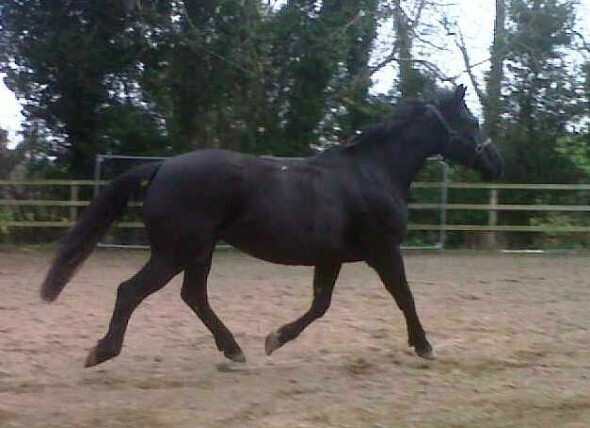 Mare is 8 years old, black, with perfect conformation and superb paces and jump. She has a lovely temperament both in and out of the stable. 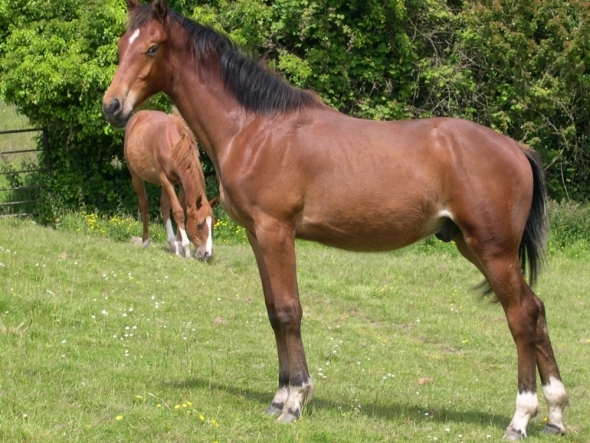 Evented for one season before becoming broodmare. 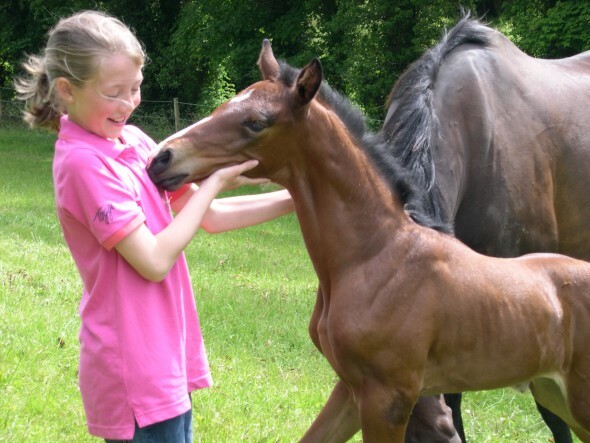 Back breeding contains high percentage of Thoroughbred, and she should breed top class eventers and dressage horses. 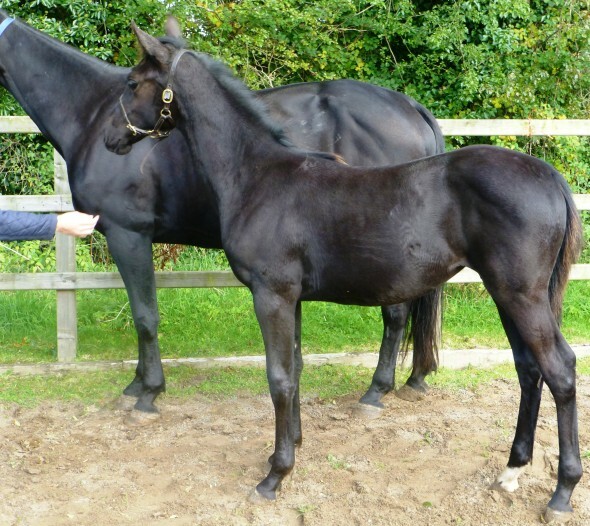 (Her 2012 filly foal by Osmium is also for sale - see below). 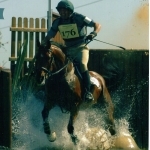 Ringfort Rara Ruby had a highly successful and high profile career as an eventer, produced and ridden for the stud by Steven Smith of Gilford. 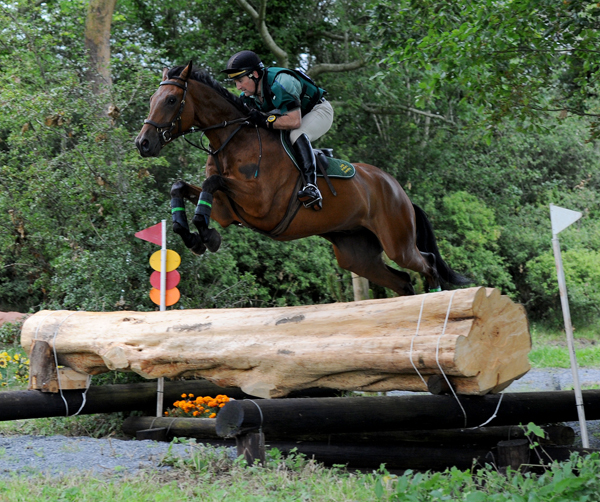 She was long-listed for the Beijing Olympics when an injury forced her early retirement to breed. 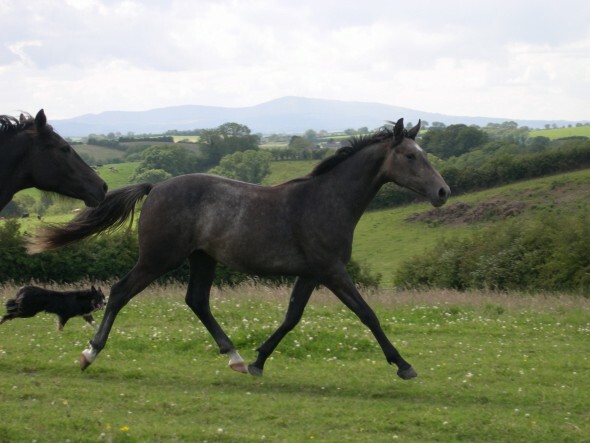 Thoroughbred mare by Lapierre, a full sister to Heineken Cup winner Mahler, and a winner over hurdles herself, she has also bred winners on the track. 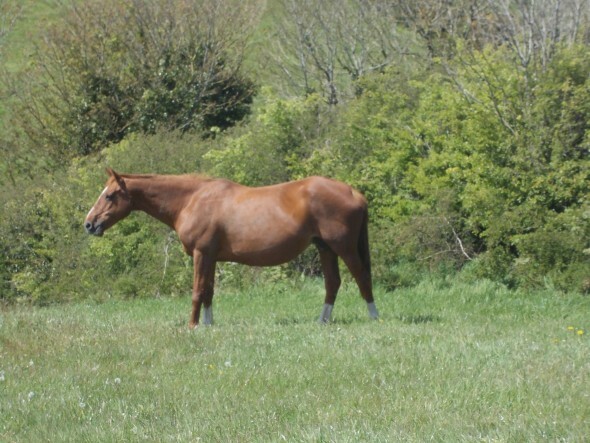 In foal to top Selle Francais stallion, Hold Up Premier, by Narcos. 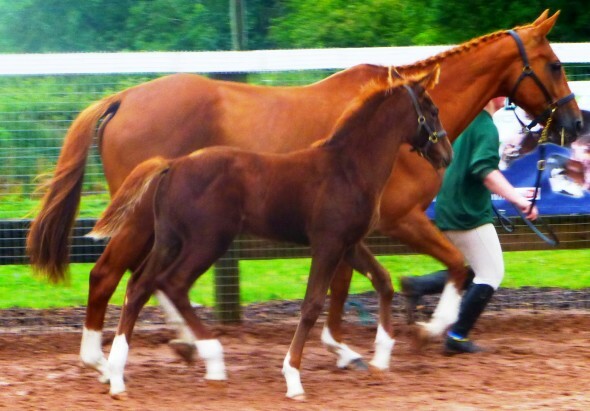 Brooodmare with bloodlines going back to one of the most famous Irish Thoroughbreds, Rulagheela. 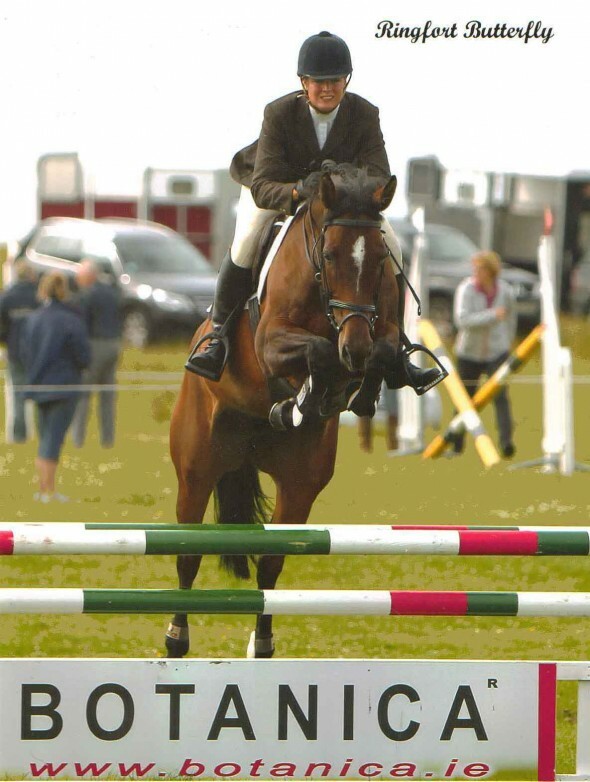 A first class eventing mare herself, ridden by Steven Smith of Gilford, she has been retired to the paddocks to breed. 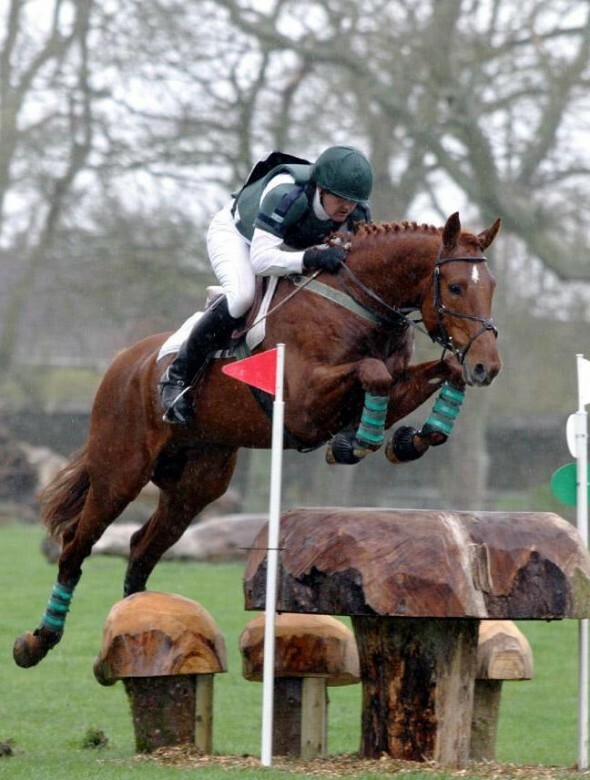 Dam of the top eventing stallion Ringfort Tinkatoo (exported to the US) by World Cup winner, Tinka's Boy, she has bred a long list of eventing stars, including Valentino Red, in the ribbons virtually every competition this season. VIDEO: to see video of RINGFORT ALLEGRA (in the lead!) 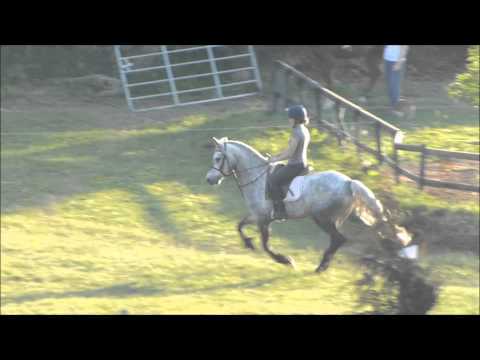 and other young horses go to YouTube, enter 20120820(173229) and search. 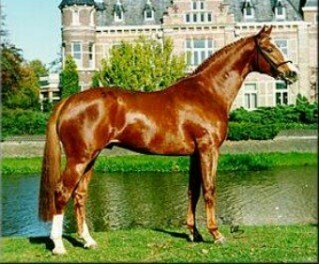 The sire of Ringfort ALLEGRA is OSMIUM, a KWPN and AES fully Approved stallion by Ferro (also known as Olympic Ferro who won silver at the Sydney Olympics) out of a Calypso 1 mare. Calypso 1 was by Cor de la Bryere, the sire of Cavalier Royale. OSMIUM won the 3 year old stallion test at Ermelo, National Champion 4 year old Dressage Horse, winner of the PAVO Cup; and winner of the 5 year old stallion competition. 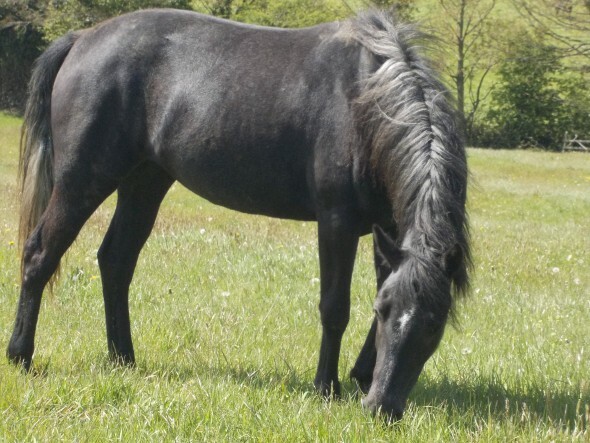 OSMIUM's dam also bred the German National Champion 3 year old mare Velvet VDT. 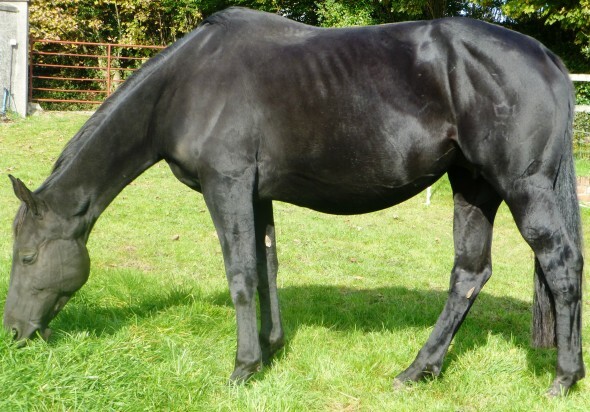 So, OSMIUM is: by a Champion sire; a Champion himself: full brother to a Champion; and was ridden by Champion dressage rider Anky Van Grunsven until injury forced him to retire to stud. 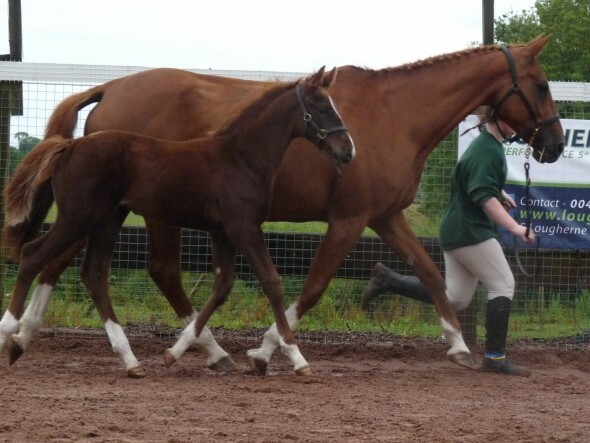 Rarely, if ever, has a dressage foal of this calibre been bred in Ireland and offered for sale. Telephone to arrange to see him. 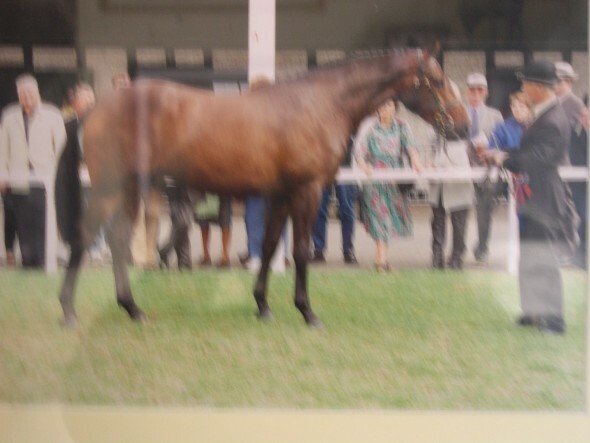 SEE MORE PHOTOGRAPHS OF RINGFORT FINALE UNDER "NEWS"
So, OSMIUM is: by a Champion sire; a Champion himself: full brother to a Champion; and was ridden by Champion dressage rider Anky Van Grunsven, until injury forced him to retire to stud. 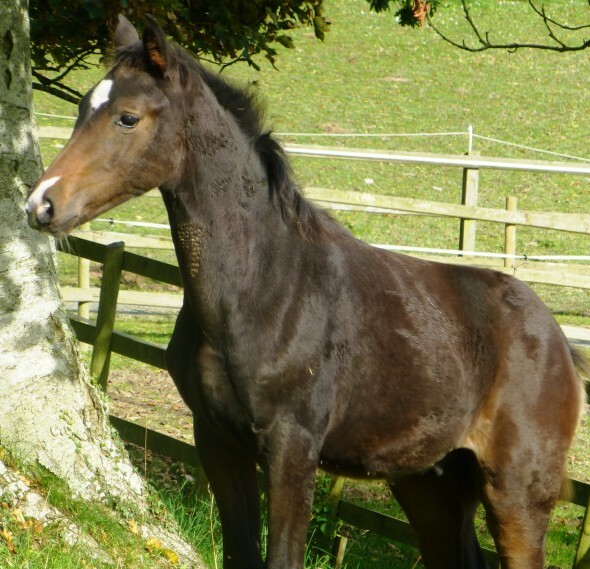 Sheepcote Solitude foaled early at the stud on May 16th this year. 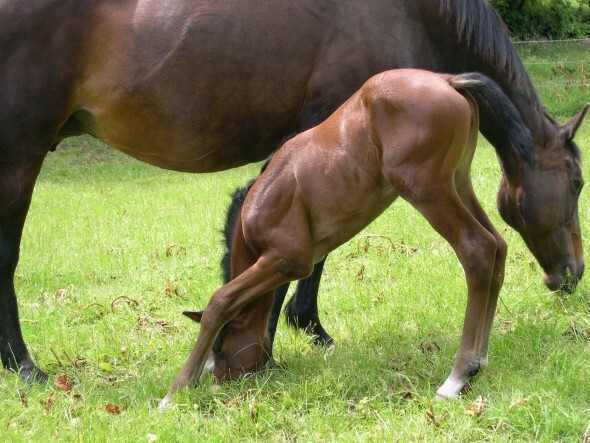 She has a quality filly with all the looks of her mother, and hopefully her talent, and that of her brother Ringfort Tinkatoo, and her father Ringfort Cruise. 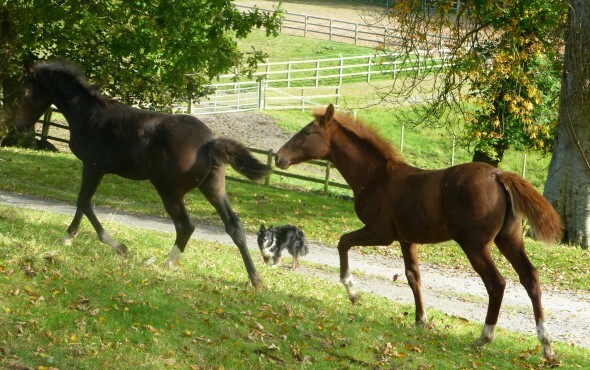 Ringfort Finale and Ringfort Solo Crossing relaxing in the Autumn sunshine at the stud, watched over by Mollie the Collie, before leaving for the Sales. 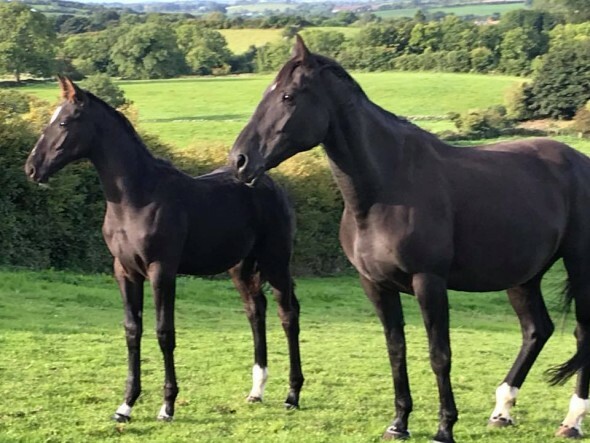 The best of breeding - out of a Porsch top performance mare and his sire the only Fully Approved Nation's Cup son of Cruising standing in Ireland. See more pictures of Ringfort Patron Saint under "NEWS". 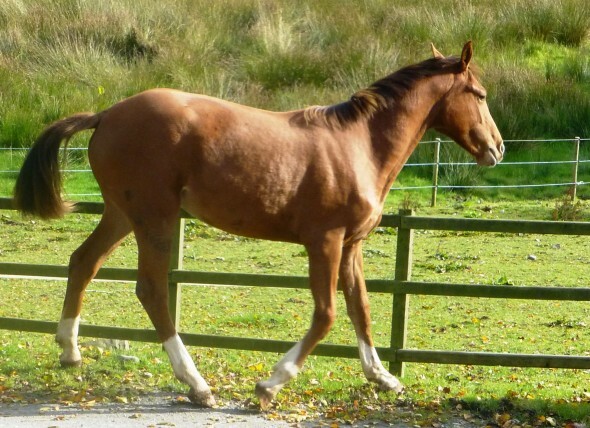 Ringfort Red Bird is a very well-grown, athletic yearling with stunning paces. 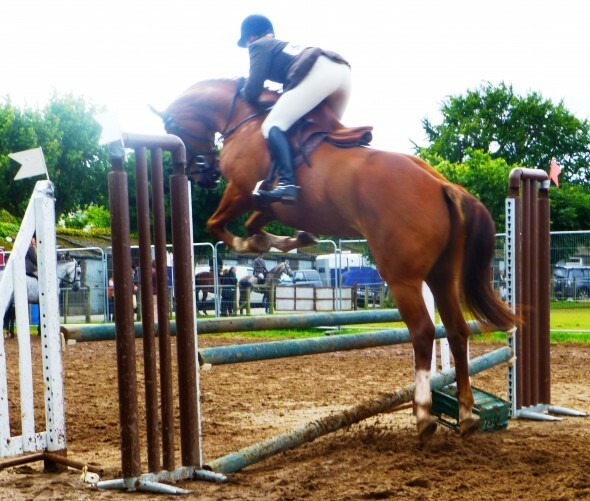 She is out of the top mare Pistazie (see under Broodmares), by the Grade A show-jumping Irish Sport Horse Stallion, Cherokee King. 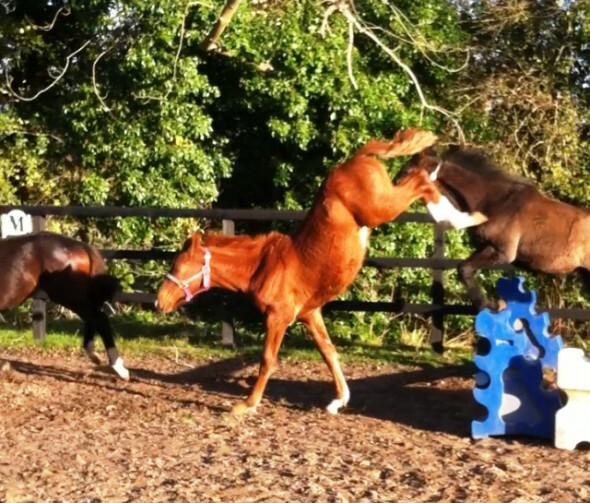 Last day in the sunshine at Ringfort Stud before Ringfort Red Bird heads off to Goresbridge Sales. 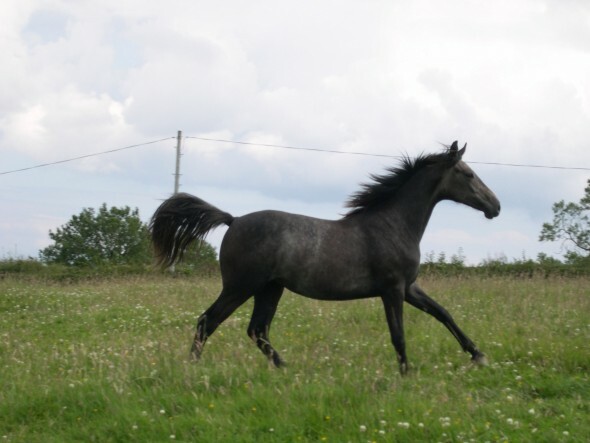 A "going-grey" two year old filly by Larino out of Renkum Hollanta. 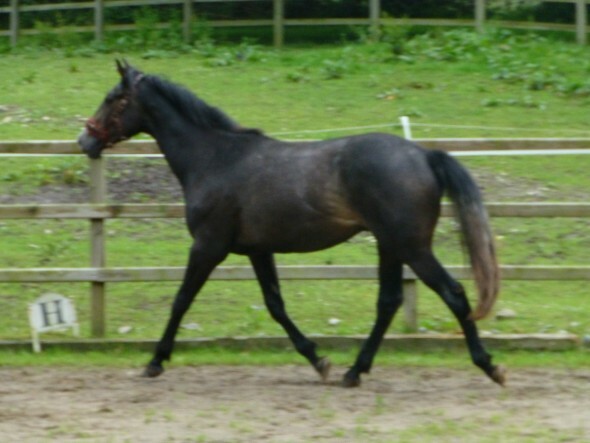 Pedigree, presence, superb step and faultless conformation. 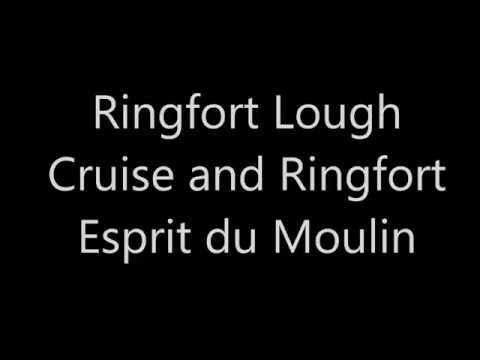 VIDEO: TO SEE VIDEO OF RINGFORT STRING OF PEARLS, GO TO YOUTUBE, ENTER 20120820(173229) AND HIT SEARCH. 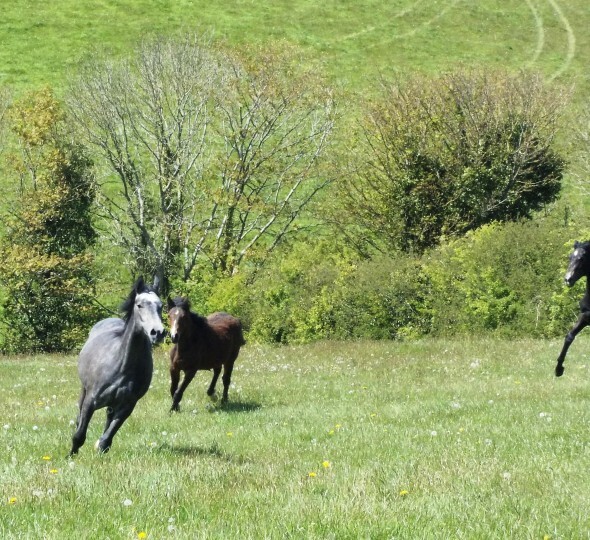 Ringfort String of Pearls (photographs above) May 2012 as a two year old enjoying life in the field - and nearly caught on camera! Stop Press: Emily Corbett has returned to University to complete her law degree. Ringfort Butterfly has now been sold. By Boherdeal Clover out of Ringfort Opera by Ohio by Iroko. 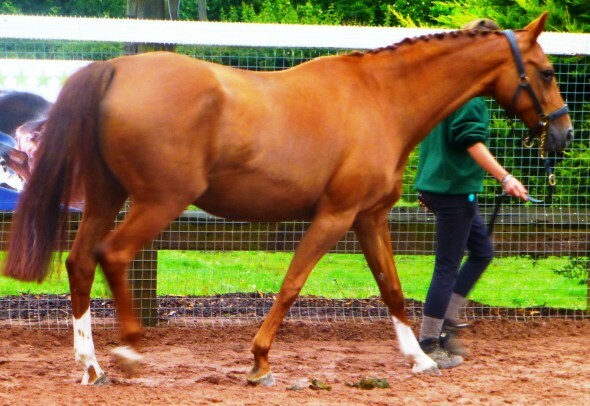 She is a six year old brown filly with SJI points to 1.10m. 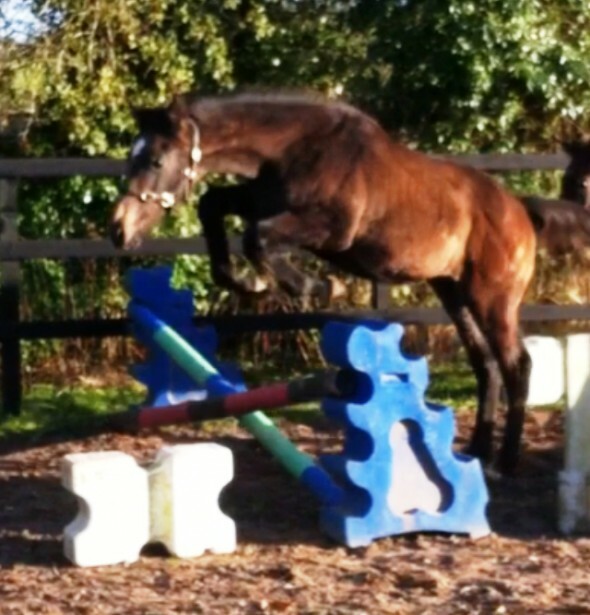 Perfect temperament and good mover as well as brave cross country. 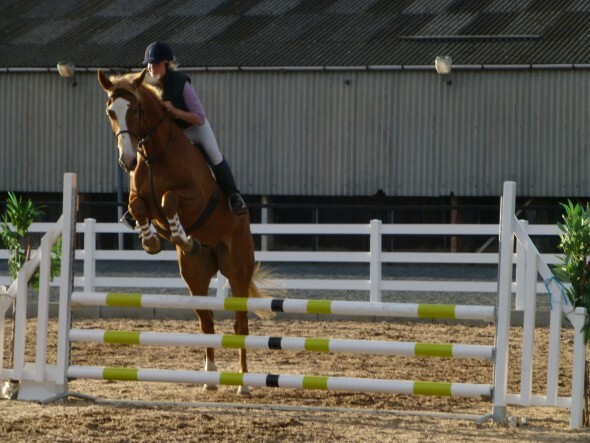 She will excel at eventing or showjumping. I cannot speak too highly about this little mare. She is just over 16 h.h. so would be perfect for a rider moving out of ponies, or for a woman, girl or small adult. In and out of the stable she is calm, sweet and totally attentive to her work. 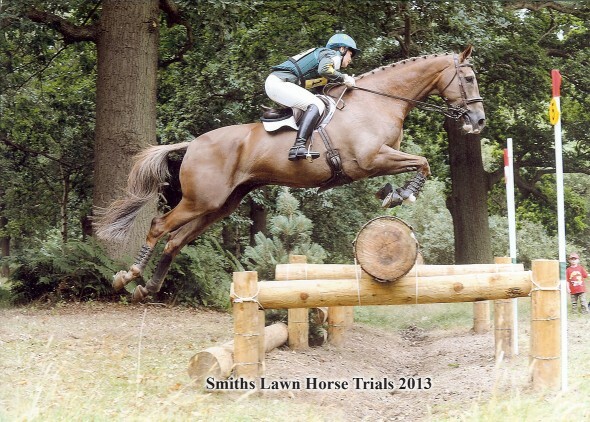 Actually she is a million dollar horse! 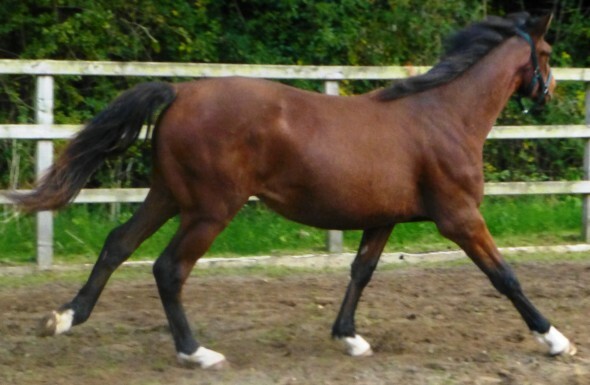 By Luidam out of Ringfort Tinkarula by Ringfort Tinkatoo by Tinka's Boy. 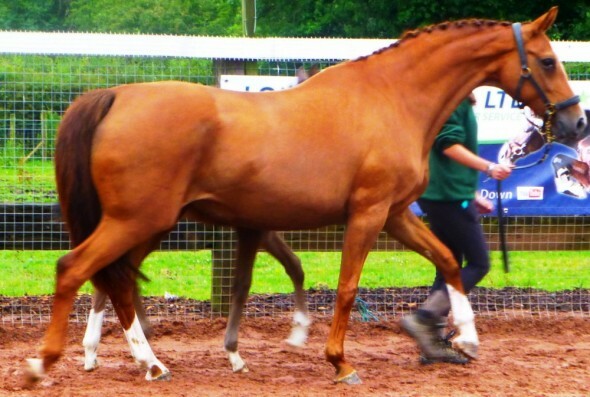 Three year old brown gelding with paces, presence and athleticism. 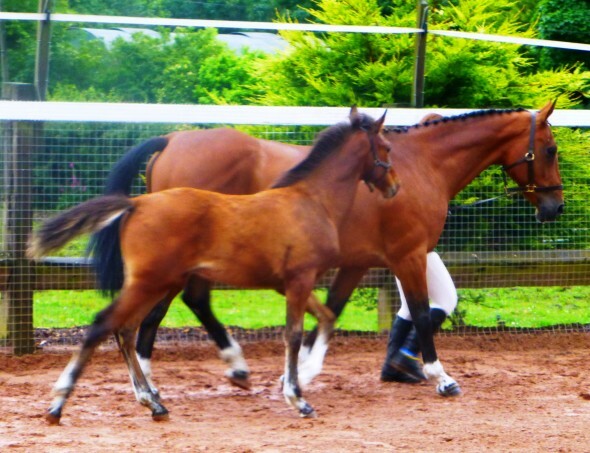 He is well developed and should be ready for three-year-old classes. See details of LUIDAM and on video by link below. 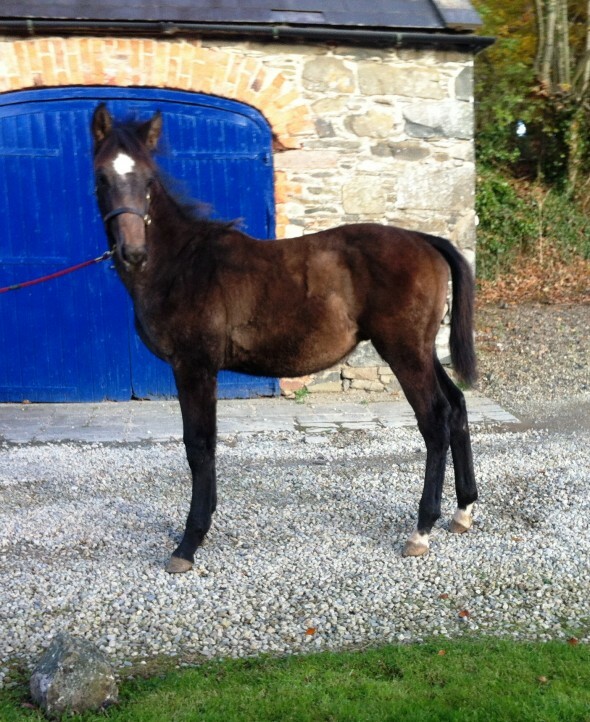 She has a yearling gelding, Ringfort River Cruise, and a filly foal, Ringfort Pebble Shore, by Ringfort Cruise. Her 5 year old Lahib gelding, Stone, having won his Maiden Point to Point, was sold extremely well to England earlier this year.